← 3D Systems Corporation—Cited For Its Personalized Healthcare Solutions By IDSA—Believes “Patient-Specific” Is Beautiful, Beneficial AND Bankable! The folks at Maker Media, Inc. (MM of Sebastopol, CA) are as “hands-on” as their eTinker, 3DPer and DigiFabber constituents in the Maker Movement. (I think MM should get the lion’s share of the credit for—if not founding, exactly—helping to coalesce, support and nurture this dynamic community worldwide.) The MM Team goes to where the action is to make (good) things happen…hands-on! Approximately 30% to 35% of all MM’s Maker Faire activity is directly related to 3D printing. So, as the Maker Movement grows—at a furious pace, as measured by the MM’s booming Maker Faire business (see below)—“Makerism” and its Digital Fabrication base is likely to be a major driver of 3DP education and popularization. As a kind of hybrid commercial/common-good organization (but very-much a business), Maker Media addresses Maker-centric issues of all kinds across what is now a rich ecosystem. 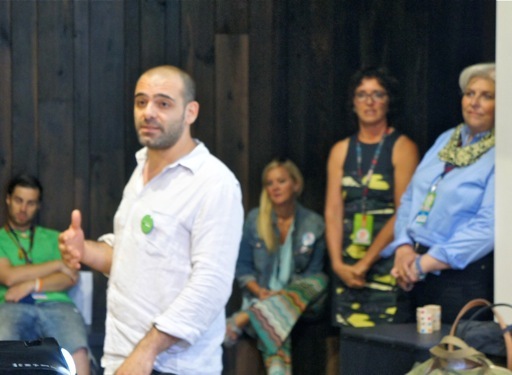 MM is focused on delivering the Maker message, “toolkit” and ethos as widely as possible. Maker Media accomplishes its mission via media publishing (MAKE Magazine), event production (Maker Faires), online merchandizing (Maker Shed) and player-coalescing (Makezine.com, the Making in Education programs and more) at multiple levels. Thursday night (10 July) in Williamsburg, Brooklyn, Maker Media came to the Techreative Borough to host a “Town Hall” around their upcoming (20 & 21 September) 5th AnnualWorld Maker Faire New York 2014 at NYSCI (New York Hall of Science) in Flushing Meadows-Corona Park, Queens. 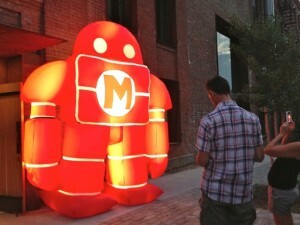 These days, event production—in the form of its booming “Maker Faire” franchise—is MM’s “growth engine” offering. In 2013—according to Maker Faire Co-Founder, traveling Team Leader, primary spokesperson and MM VP Sherry Huss Thursday night—Maker Media managed to help Maker communities, from all over the world, expand that “boom.” Sherry announced—with understandable pride—that MM assisted in successfully staging 100 variously sized Maker Faires, based on its continually evolving model, last year. These Faires took place in organizational locations (hey—just in the last six weeks or so—The White House Maker Faire, Maimonides Medical Center MiniMaker Faire for Nurse Makers in Brooklyn, and others), towns, cities and major metro-areas worldwide in 2013. Ms. Huss further remarked that “over 530,000 people experienced those  Faires.” Sherry also stated that the largest Maker Faire growth last year was in Europe—reconfirming the international nature of the Maker Movement. Given the booming, demonstrated growth-rates at Maker Faires in aggregate (2013 over 2012)—and extrapolating from the attendance figures of last year’s World Maker Faire New York (75,000)—this year’s Faire in the City could see 100,000 through the gates over its two weekend days of 20 and 21 September. One MM Teammate commented that New York City—for several compelling reasons—would likely surpass Maker Faire Bay Area (the founding venue nine years ago) in size and influence. First, the City is America’s most prominent magnet for transcontinental flights, international tourism and foreign commerce. (A projected 56 million-total tourists and travelers are likely to visit NYC in 2014, of whom over 20% debark from foreign locations.) Furthermore, World Maker Faire’s geographic location, physical growth potential and transportation infrastructure assets in Flushing Meadows-Corona Park, Queens—on the former 1964 World’s Fair site—promise growth vectors superior to the Bay Area’s. In her Town Hall introductory remarks, Sherry Huss also announced MakerCon New York 2014. This event debuted in May in at Maker Faire Bay Area. MakerCon (this link is to the 2014 Maker Faire Bay Area) is superseding 2012 and 2013’s Hardware Innovation Workshops—and perhaps incorporating other World Maker Faire Week events, e.g., Make a Makerspace Workshops—held as part of the Maker Faires in the Bay Area and NYC. The Hardware Innovation Workshops were semi-exclusive meetups of Maker insiders and industry players—and at least one was, in fact, an award winner. However—consonant with the “Year of the Maker” theme and positioning—MM is apparently out to democratize this Workshop’s usefulness in 2014 and going forward. So—Voila!—MakerCon is a conference (held during the Flagship Maker Weeks) by and for Makers. 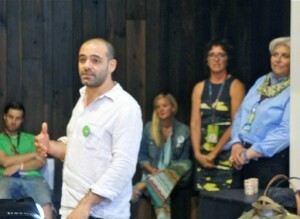 The key themes are tools of innovation, Maker community building and the business of Making. Here the fuller MM profile of this new event (see 2014 Maker Faire Bay Area online Overview here): “The Maker Movement is providing new insights into local and global manufacturing, design, workforce development, education and even creative culture. MakerCon will provide valuable, practical insights into the impact of the maker movement on science, business and technology.” Ms. Huss opined that 300 to 400 would attend the two days of MakerCon New York—prior to World Maker Faire itself—on September 17 and 18, 2014. You know, I’ve attended all four of the previous World Maker Faires here in the City. But, until I joined-in the MM Town Hall at Kickstarter in Williamsburg last week—and then researched deep into the Maker Faire phenomenon to write this article—I never really understood how rich the Maker Faire ecosystem is. 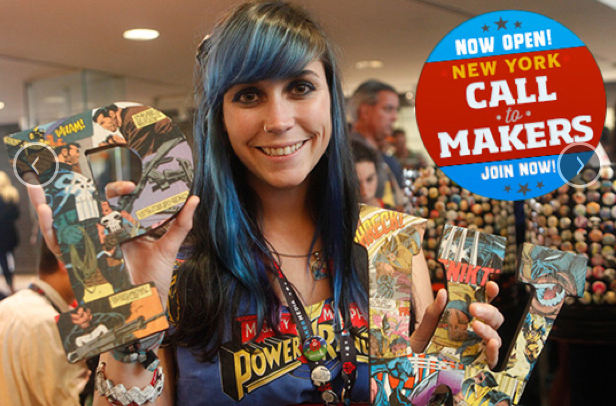 Maker Media Inc.—according to Sherry Huss—is an organization with only around 50 employees. Yet, MM has figured out how to empower a universe in the Maker Movement via its Maker Faires and its interlocking Maker Media offerings. Kudos!